Raytheon has partnered with General Atomics Aeronautical Systems (GA-ASI) to integrate its miniature air launched decoy (MALD) into the Predator B/MQ-9 Reaper remotely piloted aircraft (RPA). The companies have already completed the ground verification test phase at GA-ASI’s Gray Butte Flight Operations Facility in Palmdale, California, US, in November 2012. Raytheon Missile Systems Air Warfare Systems vice president Harry Schulte said the new product offers enhanced electronic warfare capability facilitating remote, unmanned suppression of enemy air defences. "Integrating MALD weaponry on remotely piloted aircraft systems is integral to maintaining air superiority in today’s and tomorrow’s conflicts," Schulte added. Weighing less than 300lb, the ADM-160 MALD is an advanced, air-launched and programmable flight vehicle designed to confuse enemy integrated air defense systems (IADS), by duplicating friendly aircraft flight profiles and radar signatures in the battlefield. "The low-cost vehicle is capable of duplicating all combat flight profiles and signatures of US and allied aircraft." The low-cost vehicle is capable of duplicating all combat flight profiles and signatures of US and allied aircraft over a range of approximately 500nm, and executes a pre-programmed mission following its release from the host aircraft, primarily the F-16 Fighting Falcon fighter aircraft. MALD does not require communication with, or guidance from, other aircraft or ground stations once it is launched. As well as safeguarding valuable aircraft, the system also offers counter-air operations to neutralise air defence systems that pose a threat to the US and allied pilots. Incorporation of MALD into the aircraft is expected to be completed in 2013. The MQ-9 Reaper is a medium-to-high altitude, long-endurance unmanned aircraft system (UAS) designed to conduct close air support, air interdiction and intelligence, surveillance and reconnaissance missions. The drone is currently operational with the US Air Force, Navy, Customs and Border Protection, as well as Italy and the UK Royal Air Force (RAF). 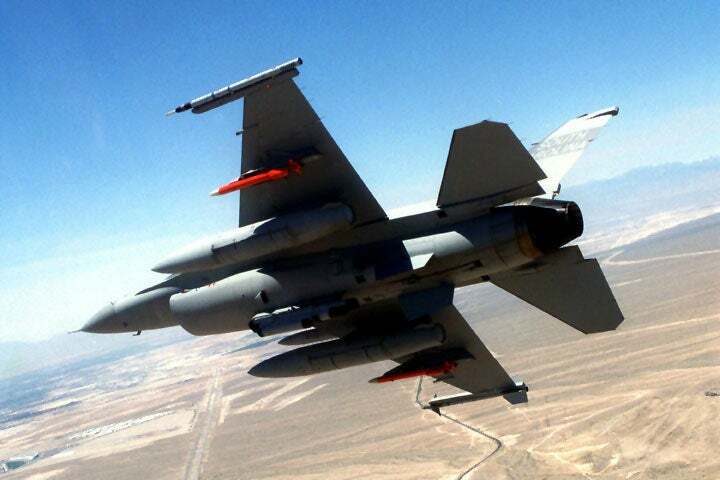 Image: A US Air National Guard F-16C aircraft carrying miniature air-launched decoys under its wings. Photo courtesy of US Air Force.